Bio Ethanol Fireplaces have originally been designed for ambiance accommodating to restaurants,lounges, bars, apartments, and homes where fireplaces have been impossible or just too expensive to build. ethanol fireplace manufacturers have repeatedly stated that they are intended only for a source of a real fire setting only. Despite this, fireplace ethanol fuel burns just like any other comparable fireplace fuels. How Much Heat is Expected From a Bio Ethanol Fireplace? The amount of heat to expect from an ethanol fireplace is a difficult broad question. Its similar to answering how fast water boils or how fast a car can accelerate. It depends on many factors. Just like everything else, ethanol fireplaces are manufactured in several different models with a variety of different burners and capacities. One of the main factors of determining BTU and kW output is the size of the ethanol fireplace burner insert. 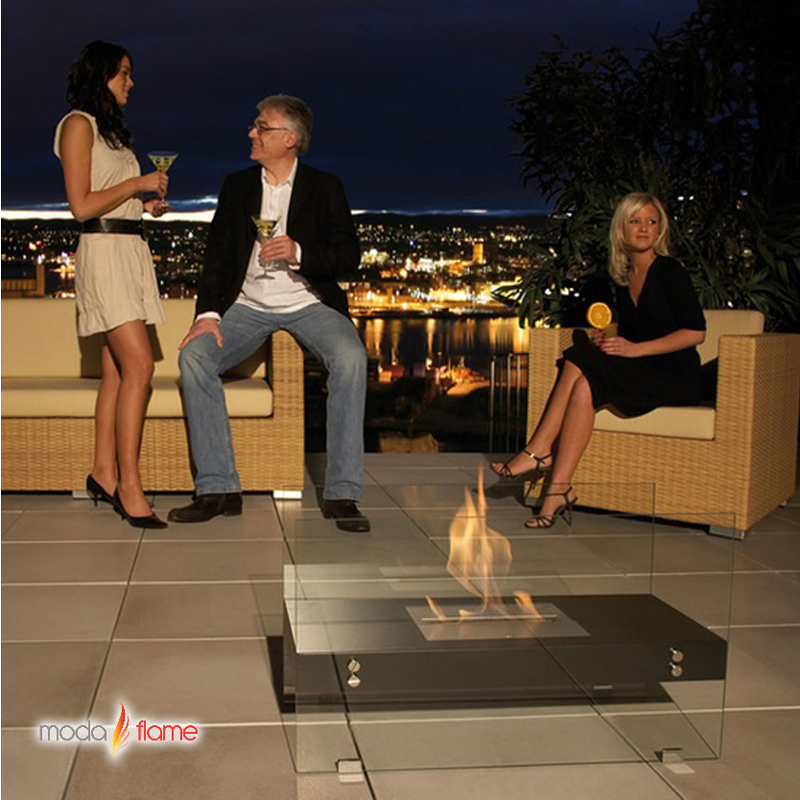 Most of Moda Flame ethanol fireplaces offer one 1.5 liter ethanol fireplace insert and have been rated of producing approximately 6,000 BTU's. Some wall mounted ethanol fireplaces carry two of the 1.5 liter ethanol burners which have the ability of offering 12,000 BTU's. Each fireplace and burner will have a BTU output on each product listing. Fireplace ethanol fuel can alter the output of heat as well. Depending on the fuel grade and purity will depend on BTU output as well as duration. However, if your in need of a primary source of heating a home, ethanol fireplaces will not be a solution you should be considering. Actually, neither wood, electric, nor ethanol fireplaces would be a suitable solution as they are not intended for heating an entire house. Fireplaces can certainly raise the temperature. Even though fireplaces are not intended on heating an entire house, you still have the ability of enjoying not only a real dancing flame on your coffee table or floor, you can rejoice the 2,000-28,000 BTU's they offer! To conclude: Although, ethanol fireplaces are not originally intended on heating houses/homes, they do have the capability of producing heat. Smaller personal table top fireplaces heat enough just to sit by and others are large enough to heat 400-700 sq. ft.
Is this product listed by UL or any testing agency or approved by the ICC Building Codes? Can we use one of the bioethanol burners with the grate and ceramic logs inserted into a wood burning fireplace with a flat screen TV mounted about 3 ft above the base of the firebox?